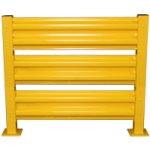 ValueRail Pro Columns are pre-drilled on all four sides allowing you to create turns and intersections in your guardrail. The column serves as a spoke that can run guardrail in any direction. When bolted together the bottom of the guard rail is approximately 5 inches from the floor. 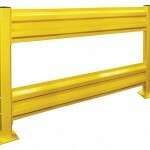 The double and triple guard rail systems have approximately 12 inches between each rail. 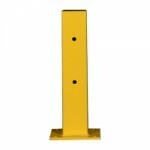 All mounting hardware noted above to anchor posts and bolt rails to posts are included with the purchase of posts. Mounting Hardware is NOT included when purchasing railing separately.